Wicked Wort is a popular destination craft brewery in the heart of the Robbinsdale, Minnesota community. Like most craft breweries the tap room is an inviting space were locals gather to socialize and sample great brews in an inviting and stylish space. Tennant’s metallic floor system with Eco-HTS™ 100 topcoat in both Tiki and Lager pigments sets the tone and invites rave reviews from customers. Easy to clean with industry leading durability, this floor will stand the test of time and traffic. 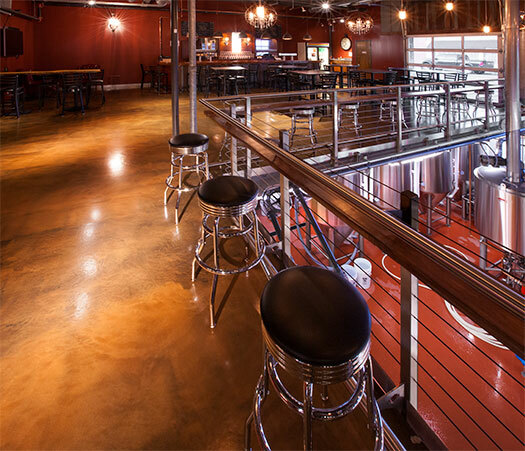 Floors in the hard working brewery in the lower level are seamlessly coated with Tennant’s high strength Eco-Crete™. A cementitious urethane specifically designed for food and beverage processing, Eco-Crete™ provides a safe, sanitary floor that demonstrates the Wicked Wort’s stylish, fun and functional personality. The metallic system uses Eco-MPE™ (pigmented black), as the epoxy primer. The build coat consists of Eco-URE™ mixed with the metallic pigment, and topcoated with Eco-HTS™ 100 to create a durable, light-stable and chemical resistant satin finish. Eco-Crete™ SF cementitious-polyurethane slurry system with aggregate broadcast is used for resurfacing interior concrete floors in areas that require thermal shock resistance and slip resistance. Then coated with Eco-Crete™ TC and topcoated with Eco-HTS™ 100 for a satin, aliphatic finish. Coatings solutions for the food and beverage industry.